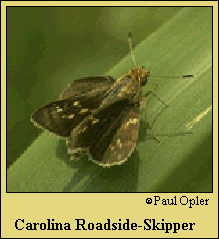 Identification: Upperside is dark brown; forewing with small yellow spots. Underside of forewing is black with a dull yellow apex; hindwing is dull yellow with brown spots. Life history: Males perch in the afternoons in sunny openings to wait for females. Flight: Three broods from April-September. Caterpillar hosts: Probably switch cane (Arundinaria tecta). Adult food: Nectar from flowers of sweet pepperbush, swamp milkweed, cinquefoil, wild strawberry, blackberry, and ironweed. Habitat: Near streams and swamps in wet woods. Range: Southeast Virginia south to South Carolina; west to northern Mississippi. Isolated populations in Delaware, southern Illinois, and northwest Arkansas. Conservation: Populations should be monitored as habitat is gradually being reduced by drainage and conversion to agriculture.